Pet Groomers are assigned with the task of giving perms. trims, teeth cleanings and nail clippings to pets. They normally work at various places, including Pet Stores, Animal Hospitals, Animal Shelters, hotels, resorts etc. They also get the option of starting their own business and providing service to the pet owners. The Pet Groomers must be well-versed in communication skills apart from being gentle and calm. While they work with the human clients, they also get attached to their pets. They need to make the pets feel comfortable so that their work becomes easier. As it is considered as scary for the animals to be taken to a Pet Groomer, the task is not at all easy. The older animals generally create much problems. The Pet Groomers are the first people to discover the health problems, which may or may not be visible. Some of the injuries such as cuts, bruises or swelling might be hiding under long or thick hair too. Sometimes, they get unnoticed, leading to serious health ailments. These things are being taken care of Pet Groomers. The Pet Groomers must have a High School diploma or a GED at minimum. They should also attend classes on dog and cat anatomy, grooming and bathing techniques, basic animal handling skills etc. The aspirants are free to go for undergraduate degrees and certification courses. Some colleges do offer associate’s degree programs in animal care, which also covers animal behavior. 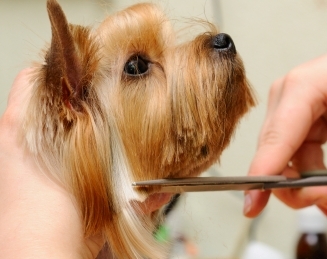 The Pet Groomers may seek voluntary certification to boost their profile. The National Dog Groomers Association of America (NDGAA) offers certification on pet grooming. The exams consist of a written test and practical demonstration of skills. Salary Information: According to the U.S. Bureau of Labor Statistics (BLS), the average hourly wage of Pet Groomers was $10.82, or $22,510 per year. The BLS also projected 15% employment growth for Pet Groomers from 2012-2022.